It is a social responsibility project that was widespread all over the country for supplying wheelchairs in exchange of plastic bottle lids to those who need a wheelchair but cannot afford to have one. Lids are gathered and brought by post or retailed store vehicles to be collected at the storage, where lids are weighed. The lids are then transported to recycling plants and wheelchairs are given in exchange of lids. The project works on a voluntary basis. With this project both the bottle lids are recycled and many disabled people have their own wheelchairs. A manual wheelchair is worth 250 kg of bottle lids. An electric wheelchair is worth 2.5 tonnes of bottle lids. 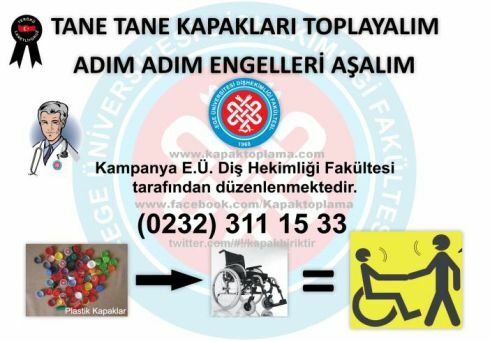 Without much publicity this campaign has become very popular in Turkey.1500 wheelchairs (manual) have been given in exchange of 375 tonnes of bottle lids collected so far by the Faculty of Dentistry, Ege University. 110 manual wheelchairs and 8 electric wheelchairs have been given in exchange of 277 tons of bottle lids collected so far by Turkey Spinal Cord Injury Association. Recycling companies, supermarkets, municipalities, private corporations, post office, schools, malls, general public. Lids are transported to repositories via postal service or trucks of sponsoring companies such as supermarket chains. 1610 manual wheelchairs and 8 electric wheelchairs were delivered in exchange of collected bottle lids. People all over the country chose to throw the lids to designated recycle bins instead of usual trash bins. This campaign was first launched in 2010 by the Faculty of Dentistry, Ege University.The aim of the campaign was to collect plastic lids since it is easier to collect only lids than whole bottles to send for recycling, in return for manual or motored wheeled chairs for disabled people. There was a great interest for the campaign all around Turkey; of both individual supporters who collect lids everywhere and institutional supporters doing this as corporates. The Spinal Cord Paralytics Association of Turkey (TOFD) also started the similar campaign in 2011. Faculty of Dentistry, Ege University ended the campaign in late 2012 and passed over their lids to TOFD. The campaign has been executed by TOFD from the beginning of 2013. Thanks to the campaign, over 2250 wheelchairs have been bought and been given to those who need them. Besides, there have been opportunities to generate employment in logistic companies, in TOFD, and in recycling facilities. Plastic wastes can cause large scale environmental, social and economic problems because collecting all used plastics is not easy and needs more effort. Due to the fact that Turkey has a long coastline, collecting and removing all plastic materials from the coast also needs extra funds. 2010-2012: 2039 wheelchairs have been given in exchange of 280 tons of bottle lids collected so far by the Faculty of Dentistry, Ege University. 2011-2013: 220 wheelchairs have been given in exchange of 250 tons of bottle lids collected so far by The Spinal Cord Paralytics Association of Turkey. The factors for the success: The campaign has been integrative and appealed to the general public all around Turkey. Lids were easier to collect than bottles. Thousands of tons of plastic material have been recycled. Employment has been created for many people. Negative aspects of the campaign: Some people took this campaign as a commercial event and tried to sell the lids they collected to TOFD. There is no funding in the campaign. The lids are collected by volunteers, sent to TOFD, and TOFD sells the lids to recycling companies for 1 TL per kg. The income from selling the lids fulfills the campaign expenses and wheelchair costs. As plastic lids have economic value and the campaign itself supports the economic cycle through the promotion of the recycling sector, including job creation, the Blue Lid Campaign is an economically sustainable operation. The removal of plastic lids from the waste stream and the recycling of the resulting plastic means that the project is environmentally sustainable. The social sustainability aspect of the campaign arises from the fact that the project provides wheelchairs to those that cannot afford them. TOFD is a member of the European Spinal Cord Injury Federation (ESCIF). The Blue Lid Campaign could be extended to the other European countries through the coordination of ESCIF.